New to the Group Ring? Requested by Brandon Lobato in Salt Lake City, Utah. First of all Great Job on your first two Best of Breed wins Brandon! That is fantastic!! I am so thrilled the podcast was helpful for you! Now, on to the group. Those first few trips around the big ring can seem daunting at best. Remember, in group competition, the judge is comparing each individual dog against its standard and is tasked with selecting and placing in order the four dogs which most closely meet their breeds’ standards. Refresh the breed standard in your head, concentrate on your dog’s virtues in relation to the standard and run through again how best to showcase those virtues. The group ring brings more room to move, more space to stand out but also a larger cast of characters, all striving to catch the judge’s eye. Be sure to watch your spacing on the line… not too close to the dog in front of you, leave enough room to stand in front if that is what you need to showcase your dog. If the handler behind has a tendency to crowd up on you, turn your dog and put your back to the handler to create a little extra breathing room for you and your dog when it’s time to turn around and stack again. If you are honored with a Best of Breed win, go to the group. It is an insult to any other dogs defeated, the judge who awarded your dog BOB and the group judge to skip it. “I’m not going to win” isn’t an acceptable excuse! Unless there are only 4 dogs present, *somebody* isn’t going to place. And I’ll tell you a little story. Some years ago I showed a 9 month old Briard to the breed … He was the only dog entered in the breed. It was the last day. It was hot. It was a judge I believed would do nothing with this gangly puppy. There were some lovely dogs in the group. I just plain wanted to go home. I whined and moaned and gnashed my teeth, but I stayed. And well I did, as that goofy puppy WON the group. Yes, there are times of emergency or what have you in which missing the group is understandable. But going home just because “it’s political and I won’t win” is not going to win you any admirers and worse, does not give you the opportunity to learn a single thing. Pay attention to the timing!!!!!! Groups start at an appointed hour and then flow based on the judge, the number of dogs in the ring, how inclement the weather is, how anxious everyone is to get to the hotel/airport/home, etc. The superintendent lists the *anticipated* group judging order in the judging schedule. DO NOT assume that is written in stone! Check the schedule of group judging when it is posted. Watch the groups ahead (this is *always* a good suggestion, no matter what, for educational purposes) in order to know when it’s your turn. I normally prep my dogs at the beginning of the group ahead of mine, but if the groups are small, the dog needs an extra rinse and fluff, extra warm up or whatever, that can change. Know what you need to do to prepare your dog to look its very best in the ring and how long it takes to do that. Then gauge your time accordingly. Aim to arrive at the group ring a full five to ten minutes ahead of your turn. This gives you time to settle your nerves, accustom the dog to the extra applause and commotion and generally get your game face on. If you need more time, there is NO law that says you can’t come earlier. Do what works best for you and your dog. Groups in the US are generally, although not always, judged in size/speed order. The exceptions are when the show is extra fancy and they ask exhibitors to line up alphabetically and give you signs to stand in front of (a la Westminster). But at most average dog shows, the long legged dogs go up front and the lineup proceeds in basically descending size. Keep in mind you want to move your dog at the proper speed for the breed. Find a dog of similar build/stature to your breed and try to follow that exhibitor. The Bulldog, Pekeingese, Sussex Spaniel, miniature dachshund and the like are not going to run around the ring at the same speed as the taller members of their group. The line up for the group entrance can feature a good bit of jostling. Just be patient, courteous and ask questions. See if you can find a mentor or friend in the bunch who can give you some on site guidance. Once you get in the ring, move around the ring as directed by the judge. Stack your dog and be prepared for the judge to walk down the line looking at expression and/or overall outline. Once the exam of the first dog starts, you can relax your dog. Play with your dog, relax, but don’t let the judge see the dog looking dorky. You can block the dog with your body if you’re going to give it free time. I’ve shown any number of dogs over the years who had limited “stamina” in the group ring. I just take them to a corner, teach them to lie down quietly and sit peacefully with them. Conversely, I’ve shown dogs with no off switch who fret incessantly if they are not constantly “working”… Know your dog and know what is best for him. Pay attention to the judge… If you notice she is checking back down the line after every dog, time a nice free stack so they can see it — do not grandstand in the middle of the ring or block another exhibitor, but be sure your dog is always and only seen looking its best. When it’s your turn for the exam and individual movement, your general target is to move the dog as far as the last number in the center of the ring and then come back. It’s a big ring, nobody needs or wants to see your dog trot ALLL the way to the end of the ring and back. First impressions count. That first sweep around the ring should demonstrate smooth, effortless and correct movement. While that first one is important, ALL impressions count in the group ring. You are playing with the big kids and if you expect the judge to award your dog, you must be prepared to have its performance be flawless. Gather yourself before you move, don’t get jiggity with your freestack. Stick to what you know works. You have MAYBE four chances to really showcase your dog. When you come in, on the line at the beginning, on the individual exam and on the line at the end. If each and every time the judge looks your dog is flawless, and your presence and presentation are confident, they WILL notice. Don’t be nervous! I know it seems scary, but it’s no different than the breed ring in the basic concepts. Don’t forget that your dog will pick up on your nerves. Confidence, or a lack thereof, travels right down the leash! Hi speed internet has nothing on a dog’s sensitivity to its handler’s moods. I know, you’re thinking, all those people are *watching* us! A version of stage fright is pretty common, but I always remind folks what my debate coach taught me in high school… If you just picture all the people around you in their underwear, pretty soon, you’re giggling to yourself and it’s nearly impossible to concentrate on being afraid when you’re laughing (in your mind!) at somebody’s imaginary tight whities. As you relax, so will your dog, making their movement, their attitude and their carriage improve 100 percent. Professional handlers are NOT the enemy! If you have a question, seek out an experienced and respected handler and ask them. I guarantee they’ve been there for the first time, just like you! As in any other situation, be sure to wait until the person is not concentrating on the dog or the judging. And handler friends, for the love of Pete, take a minute out of your coffee klatch in the corner to at least smile at the newbie. Maybe compliment their dog or their outfit or simply tell them congratulations on their win. We are ALL in this together. The more we remember that, the better off we’ll be! Making the cut. This is when the judge comes down the line for a final look. It’s important to make some eye contact with the judge, really making the pitch that your dog is worthy of consideration amongst the best. If the judge points at you for your dog to make the “short list” of 6-8 dogs to be considered for the four placements, tamp those jangling nerves down with a deep breath and keep your composure. Line up and remember this is the last chance to make a great impression. Stay in tune with your dog while paying attention to the judge for cues. Some judges don’t make a cut and simply select their placements. Continue to watch the judge out of the corner of your eye to determine if they are looking at your dog and be sure the dog is stacked and standing proud. Final reminders. Be a good sport…. congratulate the winners, say thank you if your dog gets a ribbon and someone congratulates you. have FUN with your dog! be proud, be a team… and never forget, the dog you love best is coming home with YOU! A ribbon or not a ribbon, it doesn’t get any better than that. And there you go. 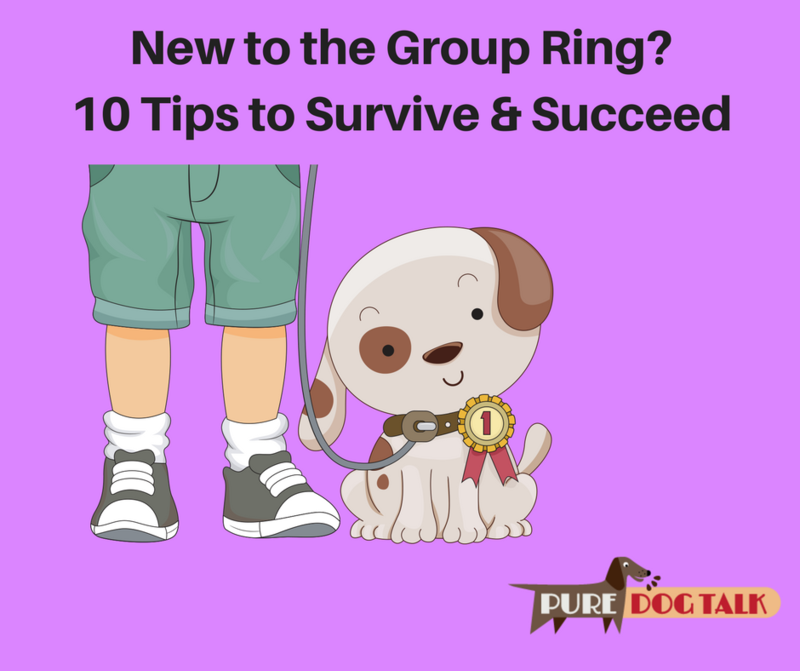 You’ve now survived the group ring for the first time. It’s all downhill from here! Catch ya’ll on the flip side. In the meantime, don’t forget to kiss your dog on the nose every day.